"Quick and easy recipe that looks like it took a lot more effort. Very pretty colouring and excellent balance of tartness and sweetness. Serve warm with ice cream or whipped cream." Preheat oven to 425 degrees F (220 degrees C). Generously grease a 9x9-inch baking dish. Bring 1 cup of sugar with the cranberry juice and water to a boil in a saucepan and let boil for 1 minute, stirring constantly. Remove the cranberry juice mixture from the heat and set aside. 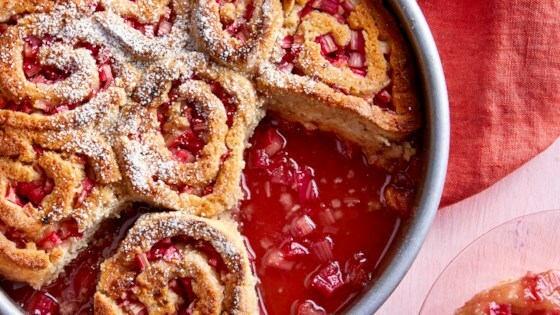 Sprinkle 3 cups of coarsely-chopped rhubarb into the bottom of the prepared dish. Mix the biscuit mix, 2 tablespoons of brown sugar, the nutmeg, and cinnamon together in a bow; stir in vegetable oil and milk to make a soft dough. Roll the dough out on a floured surface into a square about 10 inches on each side; spread butter over the dough. Sprinkle 2 cups of finely chopped rhubarb over the butter; sprinkle the rhubarb with 1/4 cup of brown sugar and 2 tablespoons of white sugar. Roll the dough up jellyroll style, gently press the seam down, and cut the roll into 9 slices. Arrange the slices over the rhubarb in the baking dish. Pour the reserved cranberry syrup over the slices; sprinkle with the last 2 tablespoons of sugar. Bake in the preheated oven until the biscuit topping is golden brown and the rhubarb is bubbling, 25 to 30 minutes. I loved the cranberries with rhubarb flavor.